For safe, secure vinyl railing applications,choose New York Sash. 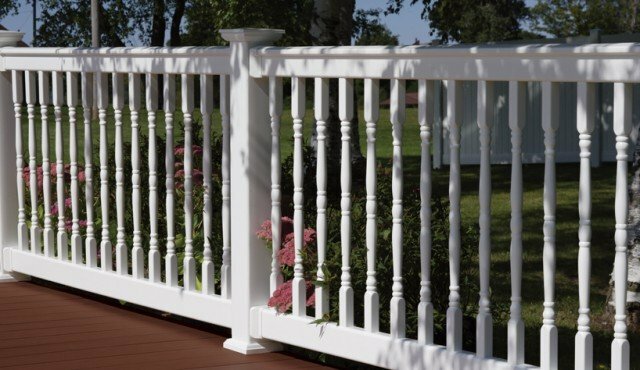 The routed system features a unique internal rail-to-post connection and hidden hardware, so there are no unsightly brackets to detract from the look of the railing. The Aluminum reinforced rail connects to a sturdy galvanized post support kit inside the routed post, for a completely concealed metal-to-metal connection. Designed for use with existing wood posts, the Oxford bracketed railing system offers everything you need for safe and secure railing installation. Oxford goes the extra mile with standard features like the concealed aluminum rail mount brackets and stainless steel screws, for long-lasting strength and peace of mind. Kingston offers premium features you’d expect to find on higher-end systems, including high-quality aluminum rail mount brackets for superior safety and security. Secured by provided stainless steel fasteners, the aluminum brackets are completely concealed by molded vinyl covers, so you never have to worry about rust or corrosion.